Mizuho Financial Group, Mizuho Bank, trading and investment firm Marubeni Corporation, and Sompo Japan Nipponkoa Insurance have completed a trade transaction between Australia and Japan using blockchain. 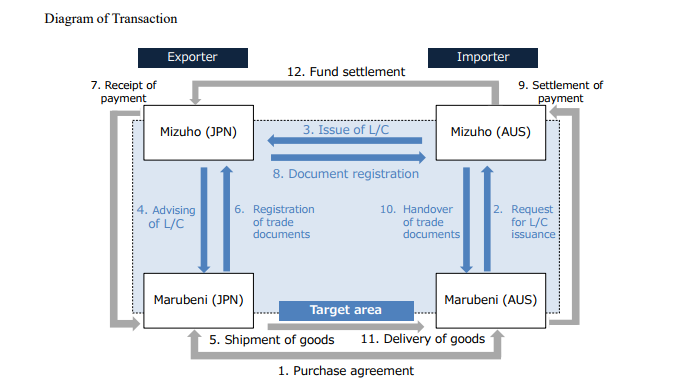 As a result, Mizuho and the other involved parties say the usual stuff – namely blockchain brings shorter delivery time for trade documents; reduction of time required to create and transmit documents, as well as labour and other costs through document digitisation; and increased transparency by sharing transaction details with all parties. They raised a few issues – including that it is not possible to transmit trade transaction information in digital blockchain to parties who do not use the platform; and that enabling the transmission of the wide variety of information necessary for transactions will require standardising the information for blockchain at an international level. Building on this project, Mizuho says it aims to further explore the practical business application of blockchain. In fact, it already has. Just with other firms. In April, Mizuho Financial Group, Mizuho Bank and IBM Japan teamed up to build a blockchain-based trade financing platform. While in February, Mizuho partnered with Cognizant to test cross-border document sharing and custom digital currency applications of blockchain. Messaging app and bank to establish JV through their subsidiaries.